Statement By The Ministry Of Foreign Affairs Of The Republic Of Cuba — U.S. - Cuba Trade and Economic Council, Inc.
October 04, 2017 / U.S.-Cuba Trade and Economic Council, Inc.
Once again, on October 3, the US Government, in an unwarranted act, decided that 15 officials of the Cuban Embassy in Washington should depart from the United States, claiming that the US had reduced their diplomatic staffing levels in Havana and that the Cuban Government had failed to take all appropriate steps to prevent “attacks” against them. In the meeting that, at the proposal of the Cuban side, was held with Secretary of State Rex Tillerson, the minister of Foreign Affairs of the Republic of Cuba, Bruno Rodríguez Parrilla, warned him against the adoption of hasty decisions that were not supported by evidence; urged him not to politicize a matter of this nature and once again required the effective cooperation from the US authorities to clarify facts and conclude the investigation. It is the second time, after May 23, 2017, that the State Department orders two Cuban diplomats in Washington to abandon the country; that the US Government reacts in a hasty, inappropriate and unthinking way, without having evidence of the occurrence of the adduced facts, for which Cuba has no responsibility whatsoever and before the conclusion of the investigation that is still in progress. As was informed by the Ministry on August 9 last, since February 17, 2017, when the US embassy and State Department notified the alleged occurrence of incidents against some officials of that diplomatic mission and their relatives as from November 2016, arguing that these had caused them injuries and other disorders, the Cuban authorities have acted with utmost seriousness, professionalism and immediacy to clarify this situation and opened an exhaustive and priority investigation following instructions from the top level of the Government. The measures adopted to protect the US diplomatic staff, their relatives and residences were reinforced; new expeditious communication channels were established between the US embassy and the Diplomatic Security Department and a committee of experts was created to make a comprehensive analysis of facts, which was made up by law enforcement officials, physicians and scientists. In the face of the belated, fragmented and insufficient information supplied by the US, the Cuban authorities requested further information and clarifications from the US embassy in order to carry out a serious and profound investigation. The US embassy only delivered some data of interest on the alleged incidents after February 21, when President Raúl Castro Ruz personally reiterated to the Chargé d’Affairs of the US diplomatic mission how important it was for the competent authorities from both countries to cooperate and exchange more information. Nevertheless, the data supplied later on continued to be lacking in the descriptions or details that would facilitate the characterization of facts or the identification of potential perpetrators, in case there were any. In the weeks that followed, in view of new reports on the alleged incidents and the scarce information that had been delivered, the Cuban authorities reiterated the need to establish an effective cooperation and asked the US authorities for more information and insisted that the occurrence of any new incident should be notified in real time, which would provide for a timely action. Besides all of the above and in the interest of contributing to the investigation and legal process established by virtue of the Cuban Criminal Procedural Law, the US received from Cuba some requests for information as part of the inquiry procedure. The information delivered by the US authorities led the committee of Cuban experts conclude that this was insufficient and that the main obstacle to clarify the incidents had been the impossibility to have direct access to the injured people and the physicians who examined them; the belated delivery of evidence and their deficient value; the absence of reliable first-handand verifiable information and the inability to exchange with US experts who are knowledgeable about this kind of events and the technology that could have been used, despite having repeatedly stating this as a requirement to be able to move forward in the investigation. Only after repeated requests were conveyed to the US Government, some representatives of specialized agencies of that country finally traveled to Havana on June last, met with their Cuban counterparts and expressed their intention to cooperate in a more substantive way in the investigation of the alleged incidents. They again visited Cuba in August and September, and for the first time in more than 50 years they were allowed to work on the ground, for which they were granted all facilities, including the possibility of importing equipment, as a gesture of good will that evidenced the great interest of the Cuban government in concluding the investigation. The Cuban authorities highly assessed the three visits made by the US specialized agencies ,which have recognized the high professional level of the investigation started by Cuba and its high technical andscientific component, and which, as a preliminary result, concluded that, so far, according to the information available and the data supplied by the United States, there were no evidence of the occurrence ofthe alleged incidents or the causes and the origin of the health disorders reportedby the US diplomats and their relatives. Neither has it been possible to identify potential perpetrators or persons with motivations, intentions or means to perpetrate this type of actions; nor was it possible to establish the presence of suspicious persons or means at the locations where such facts have been reported or in their vicinity. The Cuban authorities are not familiar with the equipment or the technology that could be used for that purpose; nor do they have information indicating their presence in the country. The Ministry emphasizes that the US Government announced decision to reduce Cuba’s diplomatic staff in Washington without the conclusive results from the investigation and without evidence of the incidents that would be affecting their officials in Cuba has an eminently political character. The Ministry urges the competent authorities of the US Government not to continue politicizing this matter, which can provoke an undesirable escalation and would rarify and reverse even more bilateral relations, which were already affected by the announcement of a new policy made in June last by President Donald Trump. 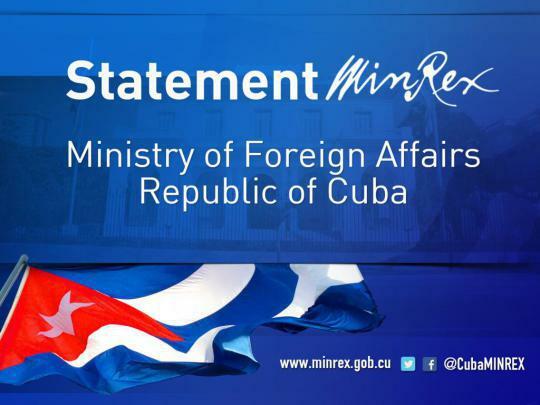 The Ministry reiterates Cuba’s disposition to continue fostering a serious and objective cooperation between the authorities of both countries with the purpose of clarifying these facts and conclude the investigation, for which it will be essential to count on the most effective cooperation of the US competent agencies.